Click chart for in-depth premarket data. Investors can't make up their minds. Up or down? Stock markets are bouncing all over the place Tuesday after a stunning rally on Monday. 1. Market overview: U.S. stock futures are looking weak Tuesday, though they have clawed back from earlier lows. European markets had initially been in the red, but are now climbing into positive territory. In Asia, most markets closed the day with gains. Chinese stock markets remain closed for a holiday. In the commodities market, prices are staying relatively steady. Oil is trading around $46 per barrel and gold is holding at $1,138 per ounce. 2. 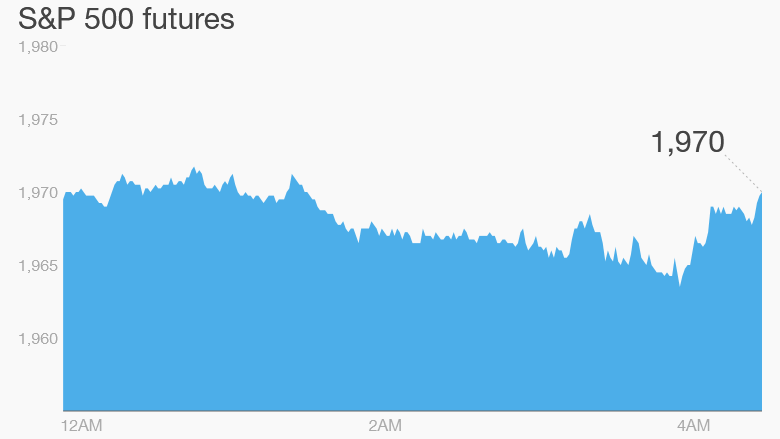 Stock market movers -- DuPont, Facebook, Amazon: Shares in American chemical company DuPont (DCDEX) are rising by 5% after the firm announced CEO Ellen Kullman is retiring and a new interim CEO is taking over. This firm also cut its earnings expectations for the year, blaming the revision on a strong dollar. Shares in Facebook (FB) and Amazon (AMZN) are dipping a touch premarket after Europe's top court made a ruling that could damage the way tech companies use and share data within their own business units. The court ruled that European countries have the right to ban U.S. companies from transferring data back to the U.S.
3. Earnings and economics: Pepsi's (PEP) earnings are coming out ahead of the market open. After the close, the owner of KFC and Taco Bell -- Yum! Brands (YUM) -- will report results. On the economic side, the Census Bureau will post the national trade balance for August at 8:30 a.m. ET. The deficit narrowed in July. 4. Monday market recap: All the major U.S. stock indexes shot up by more than 1.5% on Monday. The Dow Jones industrial average led the way with a 1.9% gain.